Sometimes, when the intensity of these times hits me I wonder how on earth did we get here? It is a routine part of all of our days to do many things that damage ourselves, mother earth, and our future. I feel I must be crazy to live this way yet it is so hard to do otherwise. This tension is crazy making in itself! It is daring to imagine that we can live differently. While it might seem beyond what I can imagine, we don’t have to invent it all. Indigenous cultures from around the world can guide us. Which brings me to the profound loss I feel over the loss of my indigenous European roots. Two of my ancestors were persecuted as witches in North America and I’m certain that generations of wise women before me were among the 6-8 million persecuted as witches in Europe. According to archeologist Marijas Gimbutas there is evidence in the European archeological record that there was a time when everyone got enough to eat and people were buried with the tools for their crafts, not weapons. After some foreign invasions the grave sites showed evidence of a few being extremely well nourished and many not getting enough. This pattern continues today. Knowing that humans have the capacity to live in egalitarian community, even if it was long ago, gives me hope. Knowing that peaceful, reciprocal communities lived in what Lyla June Johnston calls the Great Sacred Motherland of Europe, gives me new reason to have pride in my ancestry. Is this merely a distant memory? Is it completely lost? When I first started circle dancing, I had a visceral sense of connection to many ancestors before me. 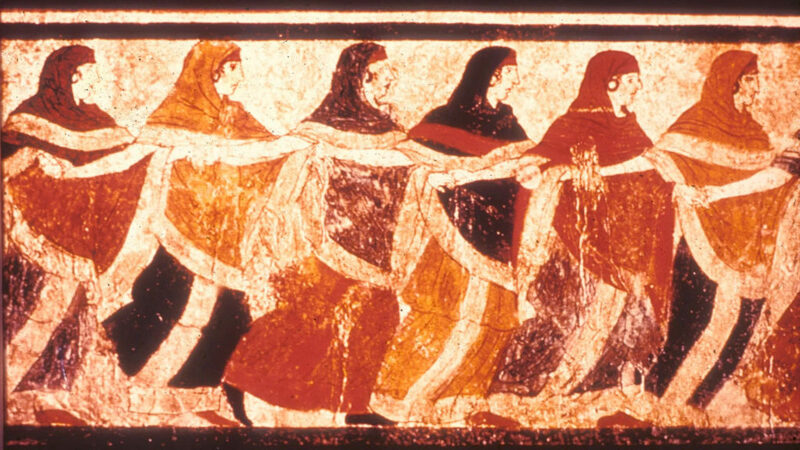 A circle of mainly women dancing is one of the most widespread motifs in the archeological record. But is my experience really connected with these ancient images? These motifs – the Goddess, spirals, trees, butterflies, suns – continue because they have meaning and power. These are images about transformation. Practices that have the power to transform, Wisdom practices, are very disruptive to authoritarian power. There is a long history of power struggles within and through the Christian Church, leading to the suppression of Wisdom: marginalizing the mystic tradition within Christianity as well as ordering the destruction of pagan temples and pagan people on many continents. It astounds me how things have been hidden in plain sight. I attended Bryn Mawr College and there was a tradition of leaving gifts to a statue of Athena to ask for wisdom and strength for final exams, something I thought rather superstitious and never did myself. Our school cheer was in Latin and I focused on stumbling through it and screaming at the appropriate time. I was only recently reminded of the translation: “Queen, descend, I invoke you, fair one. Hail, hail, hail, victory!” These are relatively obvious examples of the Goddess Wisdom tradition still afoot, yet I did not recognize them and only experienced them as silly games. Learning how to “read” women’s ritual dances and joining an unbroken chain of dancing circles stretching far back into time has given me a strong sense of roots. I also find these dances my most powerful resource for creating a vital future. As we prepare to emerge from the depths of winter, all the life that has gone underground is preparing to surface. Similarly, many feminist scholars are resurfacing the wisdom from Old Europe. I am curious how we have grown through this journey of forgetting and remembering. Very enlightened people have the same open loving gaze as a baby, yet with so much more consciousness. Perhaps as we remember Old European Indigenous Wisdom we will have even deeper understanding. Spring is a potent time to plumb the journey towards new life through the path of descent. We will be exploring these themes at the upcoming Spring Dance Retreat. No previous dance experience is required. I’d love to see you there! The quotes in this articles are from Laura Shannon’s article “Generosity and Community: the Alternative Worldview of Women’s Ritual Dance.” I encourage you to check out both Part 1 and Part 2 of this article on the Feminism and Religion Blog. Join in the ancient tradition of dancing to help the world come alive in spring on Saturday March 23. Early bird registration deadline is March 4. Learn more.